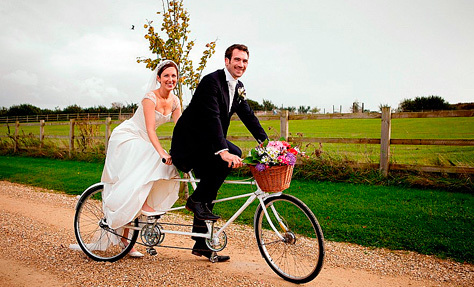 Wedding photography can be quite a mammoth task, so be prepared for that. It is the big day and not only for the bride and the groom. Numerous people are going to save some of the pictures in their family archive and if you don’t want to be hated for ages on account of the princess of the event looking fat, unhappy etc., then this is the best time to apply all of your skills at your disposal and more. One thing that is difficult to learn in photography school is crowd control. You can’t make people wait too long until you get the proper angle and do the right exposition settings. Yet everybody will expect their lovely selves to look great in the pictures, so the official photographer has to move quickly and be convincing to everybody. Although it is great to get some brilliant shots of the bride and groom, your main job is to tell the whole story, starting from the bride’s house, through to the ceremony and finishing with the most amusing shots of the merriest guests. Remember, you can’t go back and make Uncle John do the same trick once again, so make sure everything is covered. Even the highest degree in photography does not guarantee final success. The key factor in doing the job right is planning. Visiting the places of interest prior to the big day would help a lot in choosing the backgrounds you are going to use and discover how the light is going to be. It is going to save a lot of precious time at the actual shoot and make you ready for the challenges of group photos. One more important habit – be inventive. Try to choose different positions for the shot: climbing up the chorals in church, lying down or turning your camera to make diagonal shots. Use every possibility to make some humorous shots, like a shot of the groom being dragged to the altar, etc. That might not only make memorable pictures, but it will also create a special atmosphere and extra smiles while everybody adores the photos. Forewarned is forearmed. Once again, the wedding photographer has to capture all notable happenings, be prompt with the camera settings, acquire a master’s degree in crowd control and use imagination to make nice, memorable pictures. With that in mind, and all necessary equipment in the bag, you will be ready for everything.